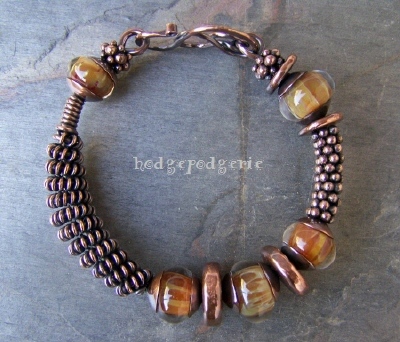 I've designed this beautiful copper bangle bracelet using solid copper wire � lots of it, twisted and coiled. 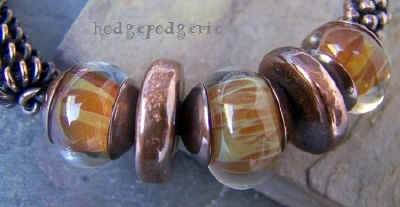 Exquisite borosilicate lampwork beads by the talented artisans of Chaotic Glass (eBay's chaoticventures) are bookended by my own handmade pure copper beadcaps. Four porcelain discs dipped in pure copper will patina beautifully right along with the rest of the bracelet. 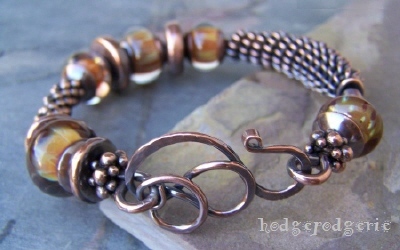 I've finished the bangle with my own handmade hammered wiredoodle clasp also of pure copper, further enhancing its unique handcrafted look. 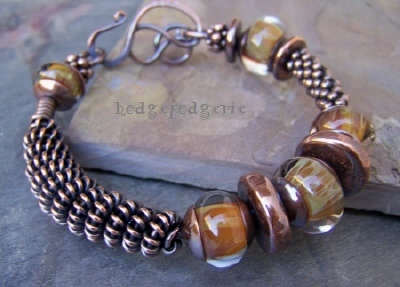 Return from "Copper Sunset Bangle	" page to "Bangle Gallery" page.